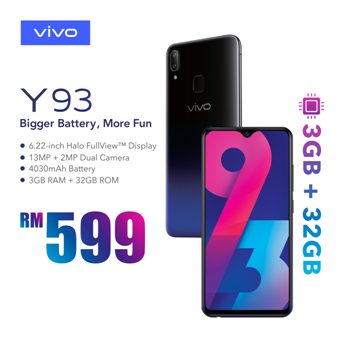 Vivo announces that the Vivo Y93 that provides bigger battery and more fun is officially available for purchase in Malaysia on 13 April 2019 after the recent success of their V15 series. By redesigning the screen and the notch, the Y93 gives the user a further enhanced viewing experience with its trendy 6.22-inch Halo FullView™ Display. In addition to their smart design, smart hand gesture controls makes using its large display effortless. The phone also boasts of a 13-megapixel + 2-megapixel dual rear cameras and an 8-megapixel front camera which is great given its affordable price point. The Y93 is fitted with a 4030mAh large-capacity battery, which works with its exclusive smart power management system, allowing for a longer-lasting endurance. Users will never worry about running out of power, which is great for those who love playing games, streaming videos or listening to music for long periods of time. 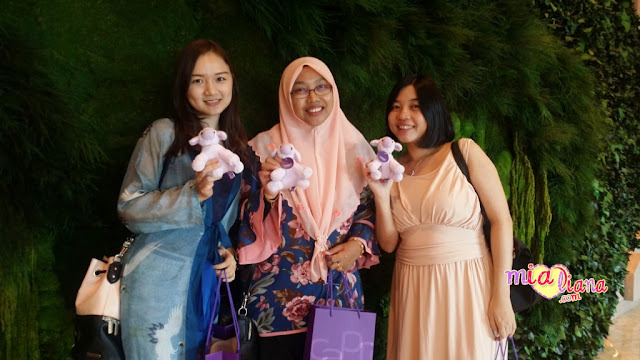 The Vivo Y93 is now available in Malaysia for the recommended retail price of RM599 and available at Starry Black & Ocean Blue two colour options.